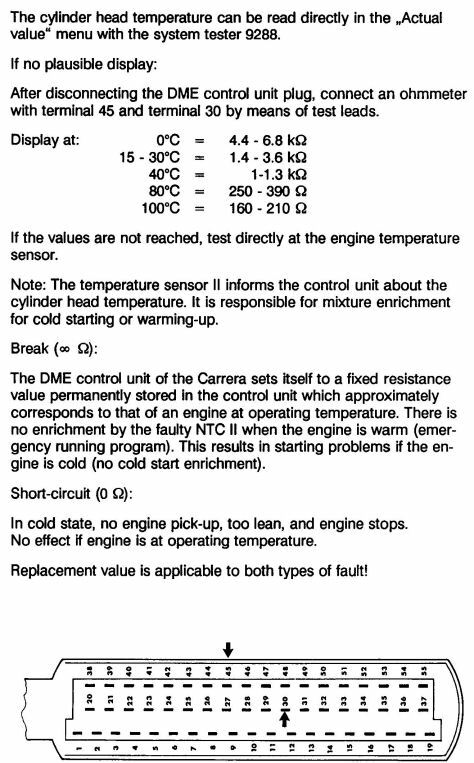 plug at the engine and the ohm reading was right on for a warm engine. I then let the motor cool over night and checked the temp sensor reading at the motor. It read right in spec at 3.6K ohms. So the sensor seemed OK.
DME cable connector off the ECU and tested the test points at the connector. Everything tested again at the correct 3.6K ohms. the test points. Hooked it all back up and VOILA she fired up just like normal.Everything is now working perfect! resistance it enters "limp home" mode and will run, just not correctly. connection problems with the DME/ECU connection before, but I now think I will pull the connector off again and spray all the connections. Thank god I had the service manual or I still would be scratching my head!